Bling - Wedding Attire Bug. 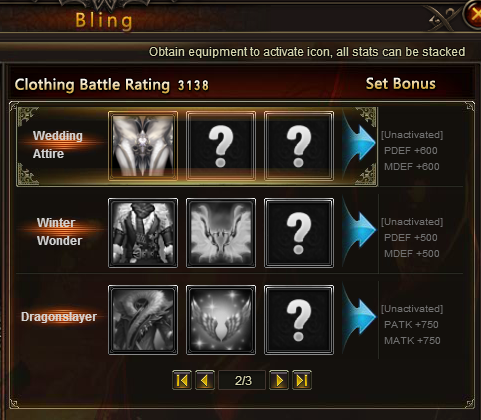 Hello , as you can see the bling option from the weeding grab dose not work . I did try clicking on it , saving the options , and everything dose not want to work. Can one of the mods report this to the dev's ? Thank you! I am having same problem with it. Won wedding garb on roses ranking last night and today noticed that bling for it is unactivated and as well it displays as that i do not own wedding garb in bling page. There is no set bonus for wedding garb but you do receive the base stats from the costume even though its grayed out there. why it is displayed in bling list then? So we get the +600 Mdef and Pdef ? Or that's just there for no reason at all ? Cus if it is whats the point of being there in the first place ?